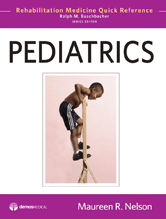 Pediatrics: Rehabilitation Medicine Quick Reference presents 111 alphabetically arranged topics covering all major concerns in pediatric rehabilitation. Organized in three sections, the first part reviews diagnostic considerations and testing while the final section highlights special considerations such as aging with pediatric-onset disability and polytrauma. The bulk of the book catalogs the diverse diseases, injuries, complications and other problems commonly seen by practitioners who work to restore function to children with disabilities and offers a quick reference guide to providing high-quality clinical care. Every entry is standardized for quick look-up in the office or clinic, and features description, etiology, risk factors, clinical features, natural history, diagnosis, red flags, treatment, prognosis, helpful hints and suggested readings.